I am doing a budget project where we learn about being an adult and all the responsibilites that go with it. We chose out of a hat what our jobs would be, married or single, if married spouse's job, and if we have any children. 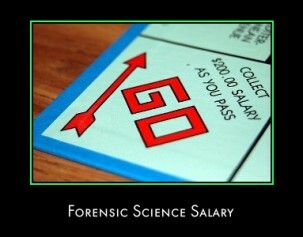 I picked a forensic scientist. For the project we have to find a salary for five years of experience, a description of the job, the education required, the courses required to complete that degree, student loan monthly payments, and our gross and net monthly income. My teacher is making everything we do have to be in Arizona so my job, house, and everything else has to take place there. If there is anyone who could help me with this project I would be very grateful. I think it would be a great idea to get a real forensic scientists' ideas and thoughts about their job. Please help me out.